The Audi A3 from 2003 onwards is fitted from factory with an Electric Power Steering Rack (EPS) and not surprisingly this is a very common failing part and extremely expensive if wanting to purchase a brand new replacement from a local dealer. The following part numbers have been associated with the Audi A3 Electric Power Steering Rack (EPS) but it’s not a complete list so don’t worry if you cannot see your part number on the table below. 1K2 909 144 H 0273 010 009 And More..! There are various ways in which the Audi A3 EPS system can fail and below are some of the common faults we’ve seen recently with this type of unit, all of which we have been able to successfully repair. If the electric power steering on your Audi A3 has failed then you will most likely be advised to have it replaced with a very expensive new part which comes with a 12 month limited warranty. The part is only available from main dealers and will require coding at an additional cost. The initial purchasing cost of a second-hand used part is relatively cheaper but this will also require programming at an additional cost and with the units being such common failures, you could end up back where you started with steering faults all over again. Second hand parts come with a limited 30 – 90 day warranty. How Can Sinspeed Assist With My Audi A3 Electric Power Steering (EPS) Fault? At Sinspeed we carry the Audi A3 electric power steering rack in stock and are also able to offer a full testing and repair service for your original unit. 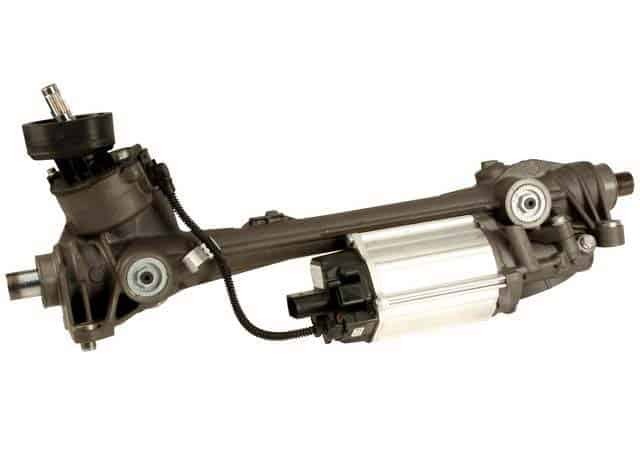 We use new genuine OEM components and uprated parts when possible when rebuilding the electric steering rack to ensure each and every rebuilt steering rack meets & exceeds OE specifications. Whether it’s a replacement or a repair of your existing unit, we guarantee you will not need to carry out any coding / programming on the parts we supply. All of our remanufactured units come with our Lifetime warranty for peace of mind. We also offer a professional diagnosis & fitting service if required. If you have an Audi A3 with an electric power steering fault then give us a call today on 0844 847 9999. Tags : 0273010009, 1K2423055F, 1K2423055FX, 1K2423055G, 1K2423055GX, 1K2423055J, 1K2423055JX, 1K2909144H, Audi A3 Electric Steering Gone Heavy, Audi A3 EPS Electric Steering Problems. Hi, my a3 Steering will sometimes work when cold but When I switch off then start up again it stops working, I hooked it up to a snap-on but it wouldnt even register a code as it didnt register. Can you please advis me on cost to put right? Hi I M Buying My Pals A3 And The Power Steering As Gone Heavy, Could You Possibly Tell Me How Much You D Charge To Supply And Fit A New One It’s A 54 Plate? MY AUDI A3 2003 IS SOMETIMES WORKING AND SOMETIMES NO… CAN U SEND ME INFORMATIONS AND PRICING? My Audi A3 2005 . The steering is only turning to the one Side. And I can’t let go of the steering wheel Otherwise it will pull Extreamly Badly to the side I can turn. Please Advice. Pulling one-way is a common issue with steering racks and we have seen this type of fault associated with the Audi A3 units before. We can fully test and repair these units and all remanufactured EPS units are returned with a lifetime warranty.